My history as a writer has been a bit half-hearted. One of the earliest dreams I had as a kid was to publish a novel, and as far as I can tell, the fantasy hasn't lost its appeal, even though my creative writing has bled dry like a creek in the desert over the last few years. I entered the National Novel Writing Month challenge last year to poke the muses, but since it was mostly a distraction from my far more difficult and terrifying thesis, I didn't get very far. 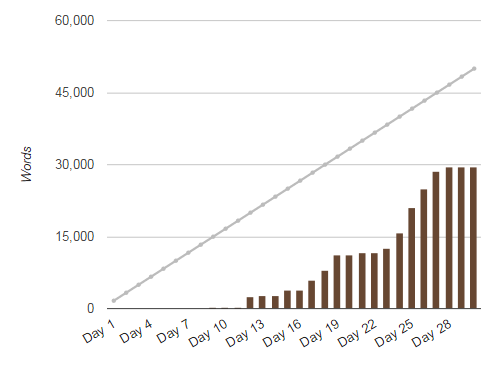 The NaNoWriMo challenge is to write 50,000 words in the month of November. I didn't get there this year either, but I got much more out of the experience than merely words. After all, who is a writer that doesn't write? My achievement graph. Words, words, words. For people who have never written but want to, NaNo is a great source of inspiration. For people who have written before, NaNo offers focus and motivation, support and encouragement, and a chance to practice. Amateurs and pros the world over get something out of it it, because even published authors fall into the trap of letting "normal life" get in the way, or of feeling insecure. Writing is a fairly solitary endeavour, but with NaNo comes heaps of online support and local events. I met some fellow writers in my area and discovered the community is a lot bigger and friendlier than I realised. I've loved the confidence I've gotten from NaNo, and how it's helped me develop my story. It's a strange experience, getting to know characters I should supposedly know everything about because I invented them. It really is like meeting people in real life, slowly building their trust, hearing about their pasts, becoming familiar with their personalities and quirks. To those who say "But you can't write a novel in a month! ", of course they're probably right. Novels aren't just about word limits. You need to plan, edit, organise, and that takes a lot longer than 30 days to do. But you can write a first draft, which gets you one step closer to a novel, and hopefully have lots of fun along the way too! NaNo isn't for everyone, but for me, it's helped me beat away the travel withdrawal blues, and I've learned a lot about the process, about how I can be a better writer. So 50,000 words or not, I feel like a winner. Thanks Mich! I hope next time I can make the 50k! :) For now I have 30k surprising words and a whole year to mess around with, hee hee. Yes I think it's so great to have all this support for creative writing. It's so nice that it's not a dying art. :) I'm surprised I didn't hear about NaNo until last year because I know quite a few people who've attempted it!